This summer I learned at least one important lesson about myself: I like to have people around. In some labs or departments, summer is the busiest time of the year with visiting researchers, grad students, and undergrads, but in my lab everyone was away for the summer doing fieldwork all over the place. I spent the first part of my summer in Ukenzagapia (a fictitious African country), but the rest of my summer was on campus. I went to school every day and tried to work, but whole days would go by with only one person even walking down my hall. There wasn't anyone around who was familiar with my research. Without others around, it was easy for me to lose momentum and hard for me to regain it. The second lesson I learned is that I need to have more than one project going at once, for many reasons. This summer when I got sick of working on my review paper, I should've had another project to switch to keep me from burning out on a project. All in all, I didn't get as much done this summer as I imagined. To give myself some credit, I did visit my field site and begin making important connections on Ukenzagapia so that next summer I'll be better prepared for my first season of data collection. I usually dread going back to school at the end of the summer, at least a little bit, but this time I'm welcoming the structure and social interactions that classes provide. I've got a bit of a dilemma with my critters. You see, the ones I need to study hang out in places that are difficult to access as a human. In order to do what I want to do, I've got to catch or observe them at the very least. After visiting my field site, I've been stumped all summer about how I'm going to do this. At ESA I talked briefly with a scientist who has the same accessibility problem in her research. As a result, she has learn to scuba dive (FYI- this is an analogy). She said that I should learn how to scuba dive too, and that there's a big scuba workshop happening at the end of September that I should attend where people can teach me how to scuba dive. Or, at the very least, I could meet 'freelance' scuba divers who I could potentially hire to work for me in Ukenzagapia. Even if I learn how to scuba dive, there will still be logistical difficulties in actually catching critters. I won't be able to do it by myself, so I'll have to have at least one other scuba diver with me. Maybe I can lure some from the U.S. to Ukenzagapia as volunteers with the opportunity to scuba dive in a new, exotic location? Also, it's expensive to learn how to scuba dive. The scuba course and conference will be $900, which doesn't include another $200-300 to get there. Eventually I'll have to buy my own scuba equipment to use in Ukenzagapia, and I have no idea how much that will cost. It's also potentially dangerous. And the Ukenzagapians would think I was totally, completely crazy. Will I be confident scuba diving in Ukenzagapia where the water is much deeper than most places around here? On the other hand, this would be a relatively unique skill that would expand my research boundaries if I stay committed to it. Also, my fellowship provides a few thousand dollars for me each year for travel and research. I think I could use these funds to attend the workshop. It does sound like fun. But will it improve my research $2000 worth? I'd be very interested in hearing if my readers have faced similar dilemmas about learning a specific technique for their research. Should I do it? Sam and I are going to begin work soon on a crumb-picking sort of literature review where information pulled from hundreds of observations will need to be meticulously organized. I use EndNote as a reference manager, and I've been pretty happy with it. If I could change one thing, I'd make it possible to color code references within a library. Anyways, Sam said he's planning to use Zotero for this project. If you use Zotero I'd love to hear what you think of it. I was also reading today about iWork, since I'll be getting a new computer before long and don't particularly want to deal with Office 2008. After reading reviews at of iWork, though, it sounds like I'm not in the target audience and so I'm probably stuck with Microsoft since I need the program to cooperate with reference managers and use things like equation editor and higher Excel functions. I'm glad to be back in classes. I'm not teaching this semester, but I am taking four classes (three real ones). I like having classes and lab meetings to structure my time. I get more done when I have a lot to do. It also makes me happy that there are people around the lab again. At our first lab meeting today there were 10 women and Herb. There are some schedule conflicts, so that number will dwindle over the course of the semester. Some undergrads, some new grads, some moderately experienced grads, and one almost-finished grad. It's a pretty good mix, aforementioned personal conflicts aside. Being away last week means that I missed all the departmentally-organized introductions to the new grad students. One lives just a few blocks from here so I offered to show her around the neighborhood. I'm also excited about the new semester because it means the price of birth control went back down and I can go to the gym again. I'm seriously going to exercise regularly this year. I'm thinking of rock climbing once or twice a week. I'm also thinking of training for a very small triathalon (seriously, the shortest they have because I'm a terrible swimmer). If I can get someone else to train with me it will tremendously improve my dedication, especially for the swimming. Today I went to a group fitness class and they have a great new instructor this semester. The instructor really makes or breaks the group fitness experience. I just changed my profile description to say that I'm a second year grad student instead of a first year grad student. Oh, the milestones! Yep, that's us. 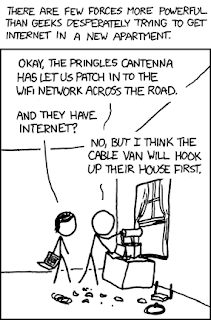 Well, it was us until our ISP finally hooked us up today 3 weeks after we called. I despise them, their crappy 'high-speed' service, and their monopoly on our building. Whew, we finally figured it out! April 25, 2009. The ceremony and reception will be near Jon's Hometown. I'll have about three weeks between the wedding and my return to Ukenzagapia for my first full field season. I promise this won't turn into a wedding blog. If I really need to blog about it that much I'll start a non-anonymous wedding blog, but I've got enough blogging for now. Barely writing (I felt a bit like this when I wrote a Thomas J. Watson Fellowship application as an undergrad). She's also working on a book, which I think is a great idea. More from me later. There are many posts brewing here in Jon's Hometown. Last week I really got in a slump about my review paper but I didn't write about it. I'm looking forward to classes starting so that I have other projects to work on. This week we're visiting Jon's Hometown. We've got to figure out a date for the wedding. We'd like to have the reception at Jon's sister's house. I'm having a hard time imagining it in another space. Renting a space also significantly increases the cost of the wedding. To have it at her house, the date absolutely has to work for her. All but the end of May is out. Due to class constraints, I will only be able to go to Ukenzagapia and begin collecting data from mid-May to mid-late-August. I'm concerned that if the wedding is too late in May that I won't have a long enough field season. So, readers, here are my questions for you. How heavily do I weigh my desired departure date for Ukenzagapia versus having the wedding at Jon's sister's house? How should I bring this up with my advisors? This photo is from the computer station they set up in the conference center. 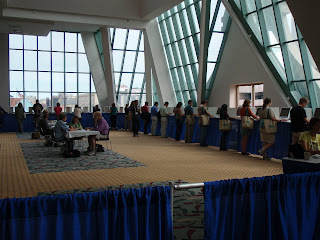 I just thought it looked so funny with all of the people lined up with their tote bags over their right shoulder. On the last full day of the conference, I took the afternoon off to do some book shopping. 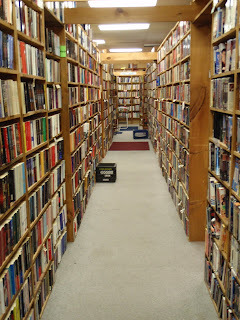 To my delight, I found not one, but two HUGE used bookstores. OMG. It make Milwaukee a lot cooler in my book. There are two of the largest used bookstores I've seen anywhere, and they're just blocks apart! 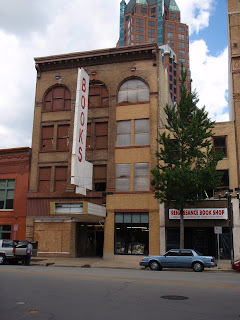 The first store I went to was Downtown Books. They had room after room and row after row of shelves. They even had a whole room (and then some) with nothing but National Geographic! The place was well-organized (for a used bookstore) and they had a decent natural history section (my favorite). I bought a cookbook and another sort of random book. 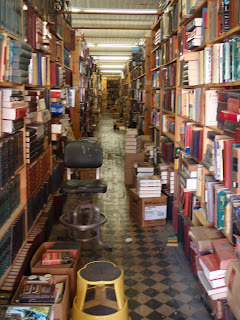 The second place I went was Renaissance Books. You can hardly miss the sign and I can't believe I didn't go earlier. This place seemed to get more organized the higher up you went in the building. 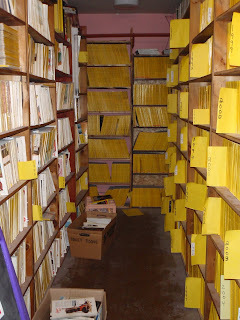 They had tons of boxes and stacks of books on the first floor. I didn't buy anything here because I was starting to worry I might not be able to bring everything home! Last but not least, Herb said he'd buy me an academic book of my choice from the conference vendors, so I was like a kid in a candy store trying to decide what to get. I chose an expensive little book that's pretty specific to my field site. I ended up missing the blogger meetup organized by BugGirl because Herb took the lab out to dinner at the same time and I couldn't just be like, "Sorry, I have a secret meeting to attend as my alter ego." Still, I got to meet up with a few bloggers who shall remain nameless (you know who you are). Overall, I'm really glad I went this year because I'll probably be in Ukenzagapia during next year's conference. It was interesting to see what goes on at a 3,000 person meeting and I had some useful discussions with different people about my project, grad school, and academia in general. More on that later. My ibook's hard drive is so small, and so full. It's 30 GB, and you can't even buy a regular ipod that small anymore. I've been getting messages that say "Your startup disc is almost full" regularly for several months. I've deleted every unnecessary program, hidden files for programs I don't need, songs I no longer listen to, and I only have photos from the past few months (with the exception of my 1 GB of RFC desktop pictures). I stopped downloading podcasts and most recently, program and system updates. That's also why it has taken me so long to post photos from the conference- I was afraid I wouldn't have room for them on my hard drive. It's getting ridiculous. This morning I was working on my review paper for a while in bed. When I went to save the measly little Word document, it said, "Disc full- Save failed." Oh crap. I had to empty the trash and quit a program to make it save. I then decided that it would be prudent to back up my entire hard drive onto Jon's external drive in the event of some meltdown. While I was backing it up it said I had 3.4 MB of free space. My fellowship will pay for a new computer, and I'm just dying to get one with a huge hard drive, but according to the Mac Rumors Buyer's Guide, Apple is coming out with the next big Macbook updates at the end of September. I just need Critter to hang in there a little longer. I bought Critter on ebay in May 2007, and the AppleCare expired last December, so it's almost 4 years old. If the hard drive weren't so small I'd wait until it totally died on me, because I plan for my next computer to see me through the rest of grad school. Holy Snapping Duck Do! I just opened mine eyes, and lo! I have not updated this since you last visited... You would not believe that my hands were chopped off and I was waiting for bionic ones. Please don't abandon me!. I am absolutely consumed with discovering time doesn't stand still, selling my soul to Google, just generally being the life of the party to anyone unfortunate to cross my path, my day is passing in a blur from the light through yonder window breaks to well after sun-down. I am quite the socialite. life is good. I vow you will see me writing more to you in the future. Well, I'll try. Just the way life is! Really, I'll post about the conference soon with pictures! That is, after I find my cable to connect the camera to the computer, my bike helmet, and the books I have to send away on Bookmooch! I made it back from the conference just in time for my students' final exam. They've been a fun group. A few students have stood out in particular, including one who I'm pretty sure has a crush on me (a 'friend crush'?). One student gave me a thank you note after she handed in the exam, which was really touching. She said she enjoyed all of the drawing we did (unlike her lab partner, who hated it). I also got a few nice thank you emails. I'm going to miss teaching while I'm on the fellowship. I hope some of my former students contact me with questions about internships or grad school. I'd be thrilled. One of my students from the spring contacted me about getting an internship at Big Natural History Museum this year (I think this is a direct result of the tour of BNHM I did for some of my students). I have a few photos to post from the conference, but I probably won't get them up until later this weekend since we're moving today. Wow, I've actually got some time to myself tonight in my hotel room because the other four people are at a party. Thankfully this place also has wireless so getting online hasn't been a problem. I'm grateful for this since I've had to finishing entering grades for my students. Anyways, I love this 3,000 person conference. I'm having a blast! I've been going to 5+/- 1 talk in the morning and afternoon sessions each day, and socializing or reading the program during the gaps when I'm not in talks. I've tried not to sit in the same room for more than 2 talks because then my classroom narcolepsy kicks in. It's been a good balance for me and I haven't been overwhelmed by the sessions. If I'm too tired I go take a nap or do something that won't put me to sleep. Lunches and dinners have been spent socializing with new people or old friends. I met two other people working in Ukenzagapia and I've seen tons of people I know from all over the place. A lot of people seem to be overwhelmed by the size of this conference, but I absolutely love it. I love meeting new people, and I'm motivated by talking with them. I think my enthusiasm for this crazy experience, along with my sluggishness this summer, confirms my deep down extrovert nature. I often have trouble (though more often outside of science) starting a conversation, but for the most part I'm energized by my interactions with people more than I am drained by them. I could write a lot more, but I'll end this for now before my roommates return. Tomorrow there's a blogger meetup! Mariya got back this week from her summer of field work. I'm so happy she's back. She spent a few nights here and then on Saturday I helped her move into her new apartment. I had to drive the truck (and technically I had to rent it too) since she doesn't have a U.S. drivers license. The whole process took several hours even though she doesn't have a ton of stuff because we had to pick things up from three different places. But, it wasn't so bad and I like her new place. This afternoon I'm leaving for the ESA conference. I'll be back on Friday morning just in time to proctor my students' final exam and then a friend of mine from last summer arrives that afternoon. On Friday evening we'll get some people over and move our things from one apartment to the other. I am so excited about our new place! I am also very excited about ESA. This is my first big conference of any sort, but I'll know a lot of people. There are some people from UBC (including Herb, Chip, and Mariya), some people from Mid-Atlantic Field Station, friends from EcoMath Camp, and my foreign study program leader from college. I'm also looking forward to putting faces to authors I've been reading this year, and meeting other people who are working on similar things. So, this next week is going to be very busy. I'm not sure if I'll be able to post from ESA, since that would require some alone time and an internet connection. We'll see!